Matthew Schiller was born in Carmel, raised in Carmel and lives in Carmel. And now, he works in Carmel. 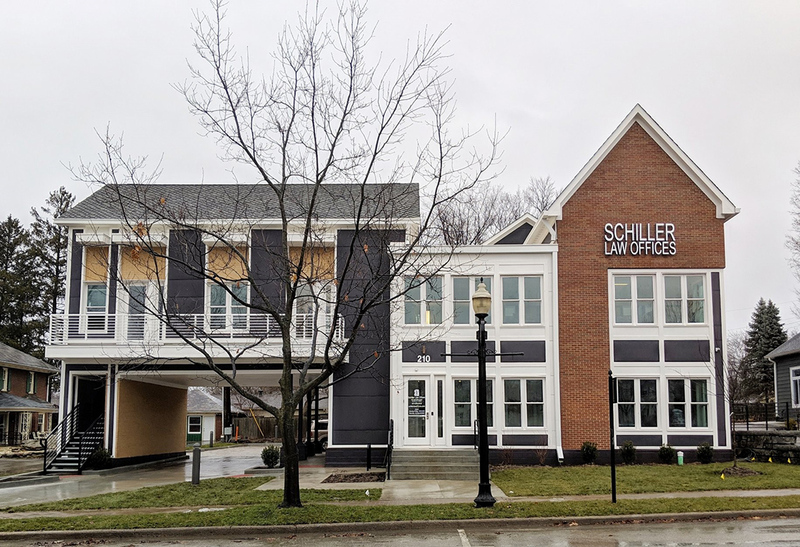 A personal injury attorney and founding member of Schiller Law Offices, Schiller recently relocated his firm from Indianapolis to a new building at 210 E. Main Street in the Arts & Design District. The two-story, 8,500-square-foot structure was built on the lot of a vacant home, which was demolished in May 2018, near Carmel High School. Schiller Law Office’s 21 employees moved into their new building in late December 2018. Schiller, who has been recognized three consecutive years as one of the Top 100 Trial Lawyers by the National Trial Lawyers Association, moved his practice to Carmel to stay connected to his roots and raise the firm’s profile in a vibrant urban setting. “I noticed all of the architectural changes in Carmel with the new buildings and believed it would help the growth of the company,” Schiller said. “Moreover, the mayor (Jim Brainard) and the (Carmel) planning commission have done a tremendous job in developing our city into one of the best in the country and allowing businesses like my own to offer more job opportunities in Carmel. Besides being recognized among the best in his profession by the National Trial Lawyers Association, Schiller also is rated in the top 1 percent by the National League of Renowned Attorneys. He is delighted to have his practice in his hometown.